Two Seventh-day Adventist-run schools in Egypt have suspended classes this week due to ongoing national protests. Otherwise, Adventist operations are not affected, according to latest reports from the region. A day before the Internet was shut down in Egypt on Friday, the president of the small Adventist community there said church operations were not affected by national protests. "There is no news at all that any of our 12 churches, 700 members and two schools are affected in any way," Llewellyn R. Edwards, president of the denomination's Egypt Field, wrote to ANN in a January 27 e-mail. Some 100 people have reportedly died in nationwide protests calling for President Hosni Mubarak to resign. 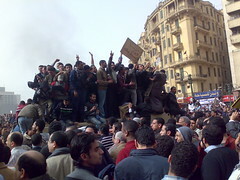 The unrest follows similar protests in Tunisia and Yemen. Phone service in Egypt was working again this weekend after most communication was shut down Friday, reports said. Tibor Szilvasi, executive secretary of the church's Middle East Union, with headquarters in Beirut, Lebanon, has since been in contact with leadership by phone. There are no reports of any threats to members or church property, he said. Both Nile Union Academy and Zeitoun Elementary school in Cairo have suspended school this week, Szilvasi said. About 130 students attend the academy and some 800 attend the elementary school. "Our members in Egypt, like the general Egyptian population, are somewhat apprehensive and waiting prayerfully to see what will happen," he said. "So far all are reported to be OK."
----------------------------------------------------Legal notice: Adventist News Network freely permits the reproduction in full or in part of its articles providing that credit is given. More info. Original article.